The Commander of the self-styled army in eastern Libya, Khalifa Haftar announced on Sunday that the Libyan crisis would be settled within the next two weeks as soon as the new government of national unity is formed. Haftar told Al-Arabiya TV Channel that within the next two weeks, Libya will witness the resolution of the current crisis through the formation of the government of national unity. These remarks come as many sources have reported that there are several movement for forces loyal to Haftar toward western Libya, especially Tripoli. 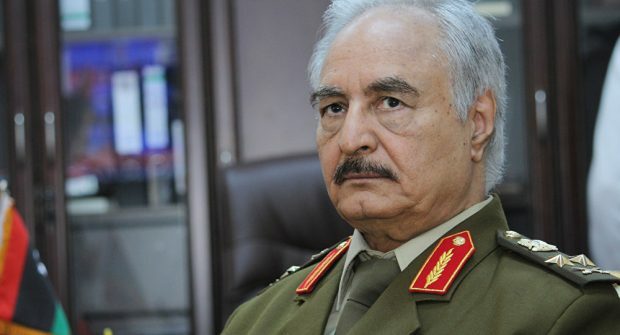 In late February, Haftar met with the Presidential Council, Fayez Al-Sirraj, and agreed to unite Libya’s state institutions and hold elections until the end of the year. In next mid-April, the Libyan parties will attend a National Conference under the auspices of the UNSMIL to try and resolve the crisis and agree on dates for the elections and constitution referendum.